With the new year comes a new layout for the blog. Thanks to my brother Will/Billy for the photo and our friends Cassie, Adele, Kathy, and Angela for the depicted rooster. Hopefully this theme is a little more personal and a little less garish. Faithful friends who began reading this blog in Year One can always brag that they were there for the overpoweringly green theme that was 2010. We haven’t seen much green around the farm lately. Lots of snow has fallen and stayed on the ground. Dry Creek, the waterway that forms the northwestern boundary of Good Life Ranch, is frozen over. This morning I saw a mink happily walking along in the middle of the frozen creek. You see a lot more wildlife when Tweedle-Dee and Tweedle-Dum (Scooter and Bailey, our house dogs) are inside. Tweedle-Dee and Tweedle-Dum don’t like to do morning chores when it’s cold and snowy, so they sit on the front porch and whine until Mama Lindsey lets them back inside. On the plus side of snowy weather, we get to go sledding down the big hill in the pastures behind the house. My parents gave Lindsey (well, both of us, but it’s been claimed) a sled for Christmas and it sure is fun to use. It’s a really nice sled – fast, sturdy, easy to turn, big enough for two people – and we’ve given it a couple of uses so far. In fact, after I write this I’m going to go sledding this afternoon. 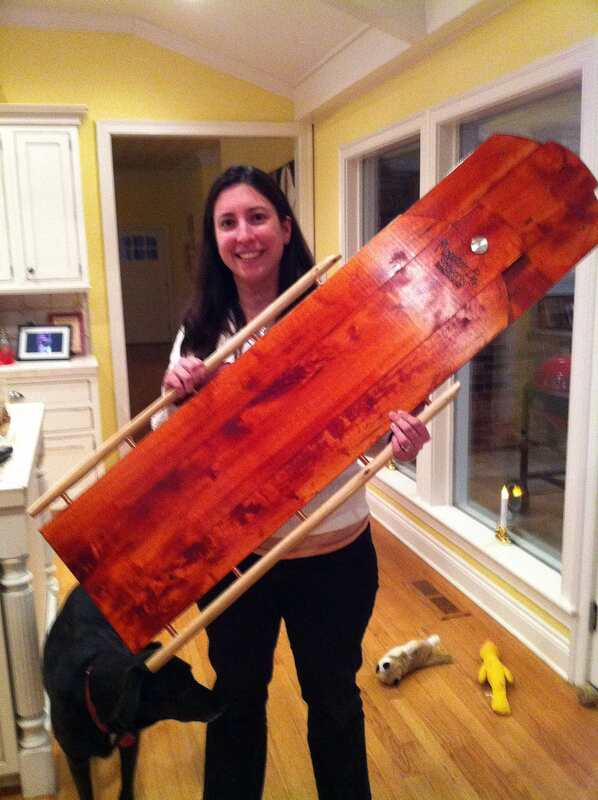 Lindsey hoists her new sled. 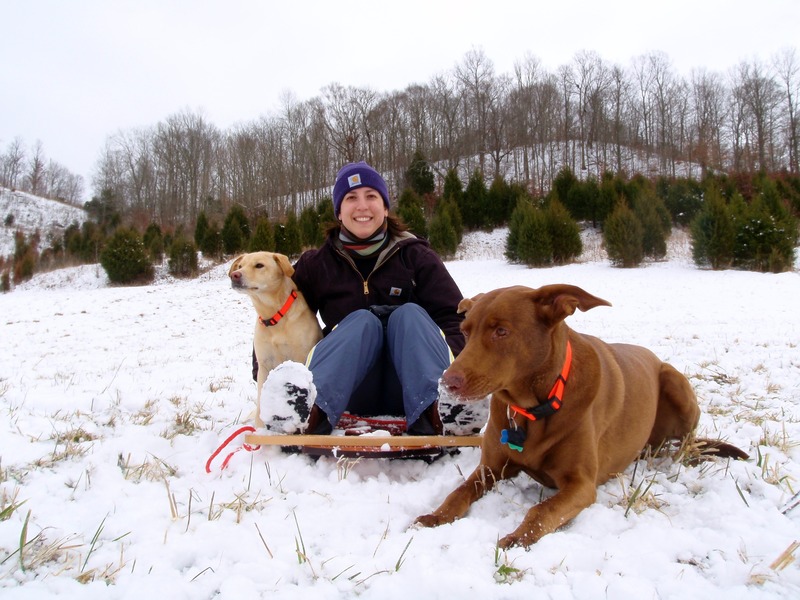 The dogs like sledding, too. They chase us down then hill and sometimes get in the way. Then at the bottom of the hill they crowd around us like they are so glad that we emerged alive from the reckless activity we had just undertaken. Then they pose for photographs. So, besides sledding, what do farmers do in winter? 1. We read and research. In addition to a couple of books for fun reading, I’ve read The Contrary Farmer, It’s a Long Road to a Tomato, and One-Straw Revolution so far this winter. 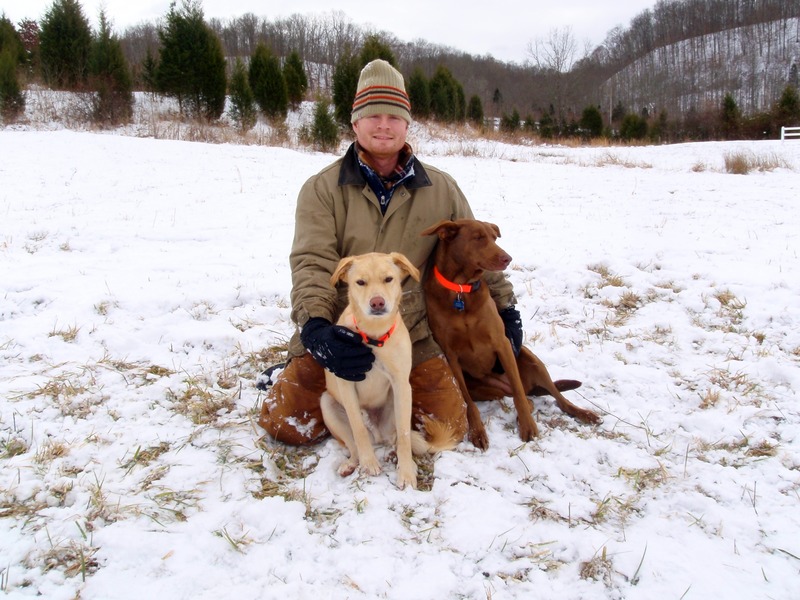 I also read other farmer’s blogs and webpages looking for ideas and tips in order to work smarter around here. 2. We plan. I’ve laid out and measured fence lines for 3 of our pastures so far. I’ve planned out 3 of the Lifestyles Lane structures that we’ll start building over Spring Break. I’ve planned out the planting schedule for our greenhouse and gardens for the year. I’ve tried to organize a Community-Supported Agriculture program for our area in 2011. No takers so far. 3. We order things. Seeds mostly. Last week I researched and ordered all the seeds we should need for the upcoming year. We are planning on having (drum roll, please): 3 varieties of onions, 5 varieties of garlic, 6 varieties of corn, broccoli, leeks, cabbage, chard, spinach, 6 varieties of lettuce, arugula, mustard greens, collard greens, beets, 3 varieties of peas, 8 varieties of beans, 3 kinds of potatoes, 2 varieties of carrots, kale, radishes, sweet potatoes, 4 kinds of peppers, 5 kinds of tomatoes, eggplants, turnips, summer squash, winter squash, pumpkins, 3 kinds of melons, and parsnips. We should also have our perennial crops of asparagus, strawberries, raspberries, blueberries, blackberries, walnuts, hazelnuts, plums, and pears. Hopefully our peaches will do better this year too. 4. We price things we’ll need. This is a good time of year to scrounge the internet and the phone lines looking for the best prices on items we’ll need during the upcoming year: fence posts and wire, feed, and seeders, for example. 5. We build up our infrastructure. During some “nice weather” pockets that I hope will be coming in the next two months, there will be some fence posts going into the ground. We have 5 pastures here on the ranch – the front field (13 acres), the side field (12 acres), the hillside field (20 acres), the creek field (15 acres), and the hilltop field (12 acres). We can’t afford to fence them all in, so we are starting with the ones closest to the road and working our way back from there. We want to get the front field fenced this winter and the side field done before the end of next winter. 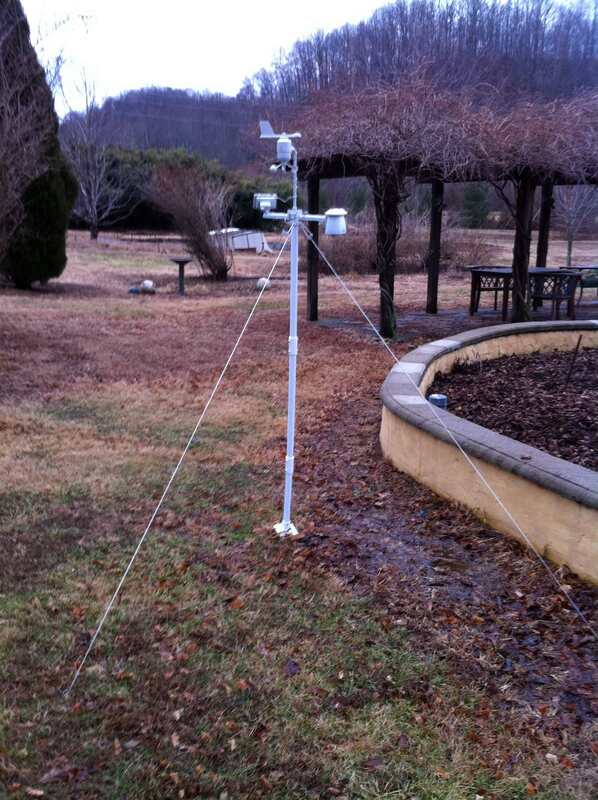 We’ve also had fun lately with our new weather station. Good Life Ranch does not have the same weather as the closest places for which the local stations report or the closest places that the iPhone apps will find. Our temperatures seem to vary by as much as 15°F from these “local” reports. We also wanted an accurate way to measure our precipitation, humidity, wind speed, etc. So my parents got us a nice little wireless weather data station for the house. I’ve had fun monitoring it and it has a nice feature of being able to download that data to a computer for storage. So far our highest temp in January is 61°F and our lowest is -3°F. 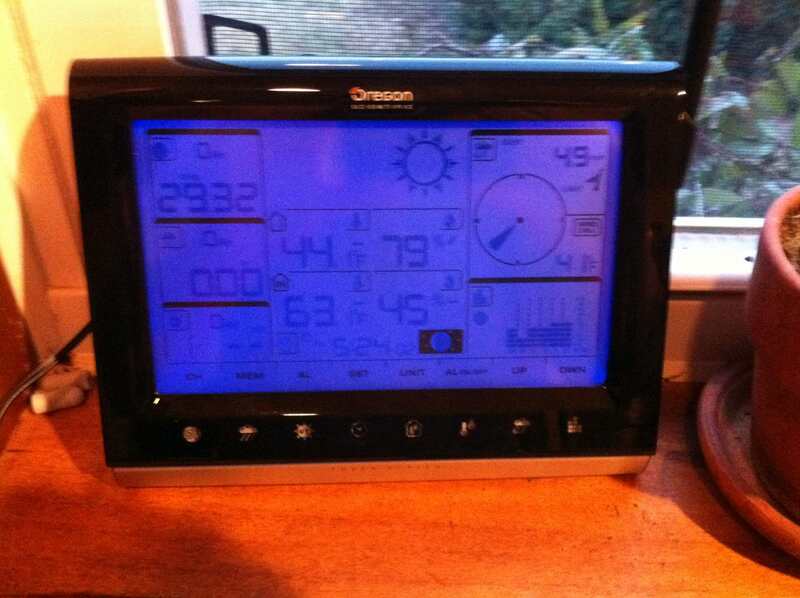 The console for the new weather station. 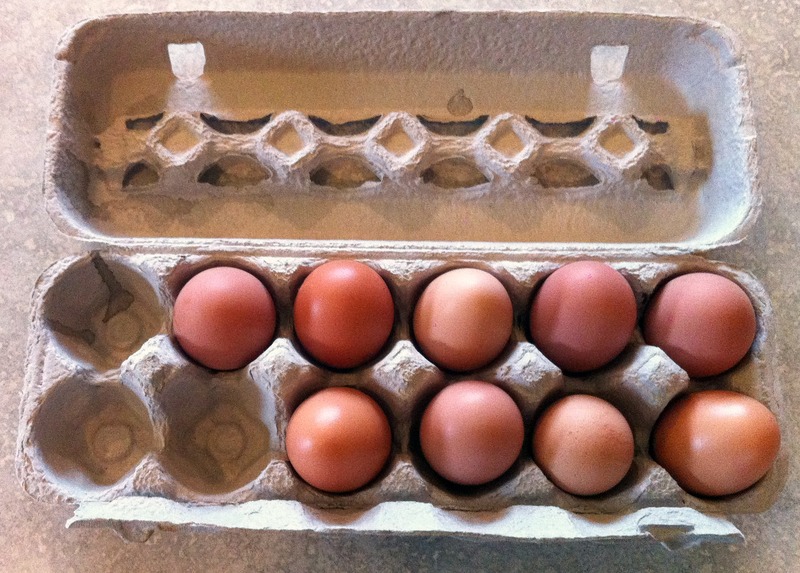 In livestock news, the chickens are laying 4-6 eggs per day. So now we’ve got enough to sell. The eggs are really good even though the yolks have paled slightly from the first burnt-orange ones we got. They are still much better than the grocery store eggs. Today they went all out and gave us 9 eggs, which is fantastic! 9 eggs from our laying hens today. Really good production for cold, snowy January without supplemental light! The goats are getting a little tamer lately. They are starting to recognize that I bring their food now since they’ve been getting hay only for about a month. Well, hay and a little bamboo that I chop out of our patch every few days. Nadine and Ivory will even let me pet them now. More correctly, I can brush the hay off of their backs while they’re eating until they notice that I’m doing it. Sgt. Pepper is growing quickly and Maggie Mae is doing a good job teaching him the livestock guarding business. Sgt. Pepper now makes a big show of barking at Scooter when the latter comes with me to feed the dogs and the goats in the corral. He’s still about half of Scooter’s weight, but he’s just as tall. The fluff makes him look bigger. Maggie and Pepper play constantly. I think she’s glad to have the canine company.